You are here: Home / Technical / My Colombian Recipes has Redecorated! My Colombian Recipes has Redecorated! For quite a while I’ve been wanting a new logo and to change the colors of my website. I can hardly contain my excitement! 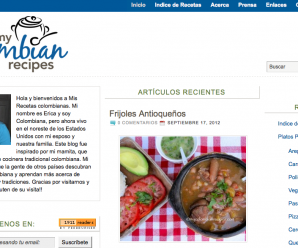 After weeks of designing and playing with colors, I am very excited today to introduce you to the new MyColombianRecipes.com! I love the new logo and colors, and I hope you all like the new look as much as I do! Stay tuned for improved site navigation as well. My Colombian Recipes in Español! I do!! Love the font, the color (gorgeous), and the logo. Very you! I love everything about your new look – so pretty, Erica! Congrats! Very Professional as well as International.Congratulations!!! I love the new look!, congrats! i do think is very pretty……there is something about the coffee beans in the original one though…….como extranamos a Colombia!!!!! I like the new look, very sleek and it seems faster to me.